The magnificent New Zealand scenery is a major drawcard for tourists from every corner of the world, quickly and comfortably accessible and completely unspoiled. But that is not all. Excitement, thrills and fun are also provided to go with our stunning scenery. Be it a hike through our abundant bush, a hair-raising ride through treacherous whitewater aboard a raft, fishing our lakes and rivers for trout or plunging headlong into gullies attached to a bungy rope - there is an outdoor adventure for all tastes and ages. In this Tourism issue, the uniqueness of a holiday in New Zealand was captured. The fresh, clean design of the stamps reflect the land with its abundance of crystal clear lakes and streams, magnificent mountains and dramatic landforms. What better way to start this post than an excellent used example of the 45c White Water Rafting - from the Booklet. This issue included five stamps with a very unusual formate, being higher or in one case wider than the normal postage stamp. The subjects were chosen to showcase adventure activities that a visitor to our country could include in their holiday. Single 45c 'Bungy jumping' gummed stamp. Queenstown is New Zealand's bungy capital, with thousands of 'fearless' visitors having taken the plunge. The sport involves plummeting headfirst from heights of up to 70 metres at up to 150 kilometres an hour but saved from what appears to be certain demise at the very last minute by a rubber bungy rope attached to your ankles. Not for the faint-hearted! Single 80c 'Trout fishing' gummed stamp. With some of the best brown and rainbow trout fishing rivers in the world, tourists flocked to New Zealand to try their hand in our well-stocked lakes and streams. Through the months of April, May, September and October some of the best fishing has been found in the Taupo-Rotorua district, whilst from October to April trout are have been reasonably plentiful throughout the country. 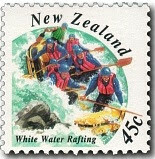 Single $1.00 'Jetboating' gummed stamp. The internal propeller and unique water jet propulsion system gives the jet boat its remarkable ability to manoeuvre in the most unlikely manner. Speeding through narrow gorges, around difficult corners and down shallow rapids at speeds of up to 45mph is an exhilarating way to see the countryside. It can stop 'on a dime', turn in its own length and instantly change direction and that is why in the past more than 75,000 people yearly have gone jet boating on the South Island's Shotover and Kawerau Rivers alone. 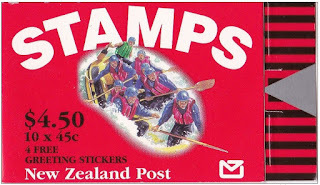 Single $1.50 'Tramping' gummed stamp. In New Zealand, there is an abundance of tramping tracks, walkways and accommodation huts. These routes have taken trampers through some of the most magnificent, unspoiled scenery of flora and fauna, which includes waterfalls that cascade into placid lakes and the myriad of native mosses, ferns and trees. Single $1.80 'Heli-skiing' gummed stamp. Up, up and away by helicopter and you will discover stunning locations and find virgin snow trails. Operating under strict and stringent safety standards and with expert guidance, heli-skiing has brought some of the most magnificent mountain terrain in New Zealand within easy reach of the adventurous. 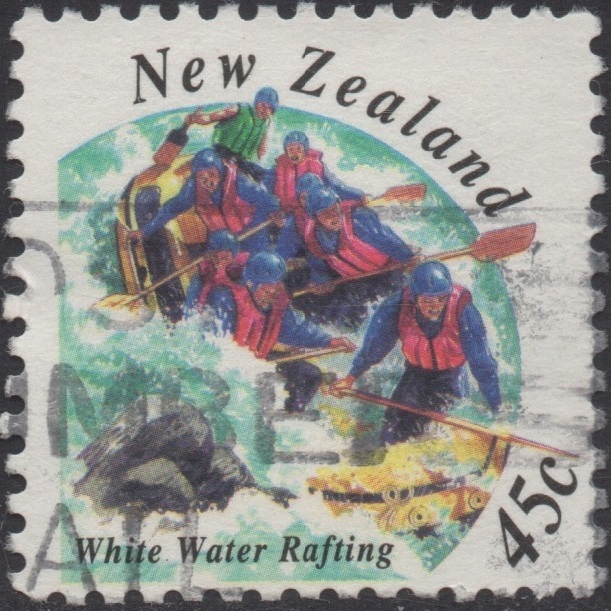 Single 45c 'Whitewater rafting' gummed stamp from the booklet. The exhilaration of plunging through the wild turbulence of gorge rapids, literally going with the flow, is an experience not to be missed. Whitewater rafting is action packed! The rafts, custom-built to withstand the power of the river, are safely and skilfully guided by experienced handlers. Fast, furious and fun. 10 x 45c stamps from the booklet. 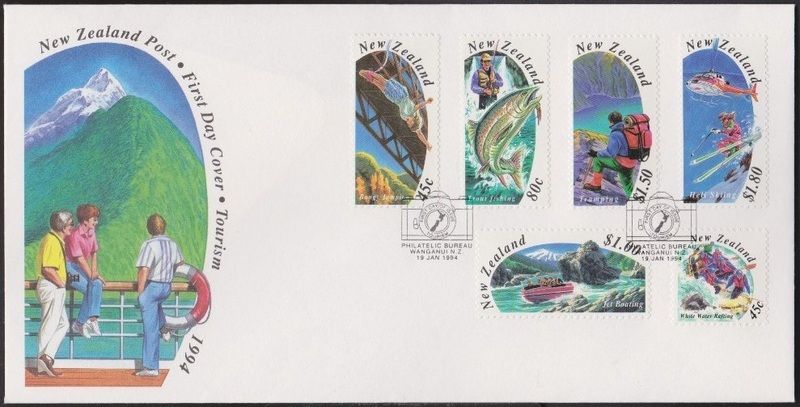 First Day Cover - 19 January 1994. Hong Kong '94 Tourism Miniature Sheet - $1.80. Hong Kong's history of postage stamps dates back to 1862 and the philatelic exhibition entitled Hong Kong '94 was staged to commemorate this long history. 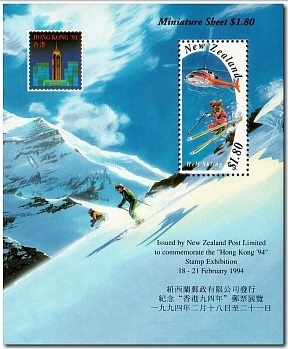 A miniature sheet was produced to commemorate the exhibition incorporating the $1.80 1994 'Heli-skiing' Tourism stamp. These stamps remained on sale until 19 January 1995.